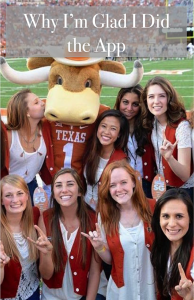 Texas Orange Jackets is the University of Texas’ oldest women’s honorary society. Its tenants are scholarship, service, and leadership. While this essay is about Orange Jackets, the themes of service, connection, and confidence can be applied to many organizations across many universities. I had relatively little knowledge about Orange Jackets before applying (hence why I wanted to put time into writing this!). Many of the women I’ve looked up to over the past two-three years of college have been Orange Jackets – from the very first female engineer I met on campus (who was also studying Plan II and pre-med and taking a 21 hour semester!) to the girl who TA’d my favorite class at UT so far (and the TA before that and the TA before that) to the girl who was a consistent presence in church and super passionate on connecting with the other students there (like me when I felt very new). I joined Orange Jackets because I wanted to be part of an organization to develop friendships with and learn from these women and the many others at UT. Serving diversely and meaningfully. Serving others by volunteering at an urban farm, serving breakfast to homeless men and women, and chaperoning at a fundraiser for SAFE alliance has opened my eyes to the needs of the community. Consistent trips to the Settlement Home for Girls has allowed me to recognize the blessings I have had and to learn how to give to others meaningfully and regularly. Strengthening my relationship with UT. As official hosts of UT, OJ’s are present at many university events, celebrations, and ceremonies. I have served at events for the law school, art school, and with city officials. Singing the Eyes of Texas at the Baylor football game (and watching our awesome win) brought me so much pride. I have learned from leaders (both professionals and students) of campus organizations and programs who have spoken in OJ meetings. Helping organize Project Period allowed me to connect with administrators and student groups on campus to bring much needed products (pads and tampons!) donated by students themselves to UT, free of charge. Meeting women who are leaders all across campus. As someone who spends most of my time in Engineering classes [which are ~83% male :)] I have loved meeting even more extremely intelligent, driven women who are leaders in biology, computer science, education, social work, business, english, communications (etc.) classrooms as well as in student government, research, community service, teaching, and journalism. Becoming aware of a social issues. After joining OJ’s I realized how easy it was for me to become absorbed in classes, homework, and projects without realizing the impact of my choices (and those of my peers, university, city, and country). I have found that the women in Orange Jackets care not only about their own development and success, but also that of those around them… especially those who do not have access to the resources and freedoms that I do. This has opened my eyes to needs and ways that I can serve others. Learning how to work with passionate and confident people. Each year’s Tap class works on a year long project focused on a campus or community need of their choice. The process of determining a project, allocating roles and resources, and making it a success is a huge challenge, especially among 20+ women who are very confident in their ideas and skills. I learned about maintaining good relationships even in differing ideas, learning how to give more than take, and realizing the empowerment of sharing responsibilities. I am extremely thankful for the experiences, lessons, and friendships I have received from Orange Jackets. However, serving others, developing relationships with passionate and hardworking people, and becoming more invested in my time at UT has been available to me since I began my freshman year and is not exclusively Orange Jackets. Regardless of whether you’ve been interested in Orange Jackets for years, couldn’t care less, or don’t even know what Orange Jackets is, the joy and excitement that comes with scholarship, service, and leadership are accessible to all of us in our universities, communities, and workplaces.